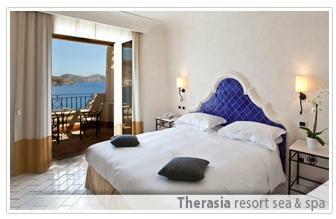 Hotel Therasia Resort, Vulcano (Island). 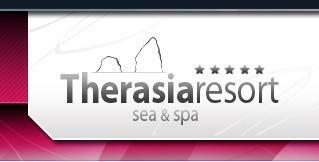 Therasia Resort Hotel Vulcano (Island). Elegance, style and simplicity, three words define the essence of Therasia Resort, set against the sea and sky surrounded by the unspoiled nature on the promontory of Vulcanello, with the horizon opening over the Mediterranean sea. The hotel was completed restored in 2006, in true Mediterranean architecture, using local materials such as lavic stone from Etna and hand-crafted Sicilian terracotta. Particular attention has been given to the resort's cuisine with two restaurants; "L'Arcipelago", open for dinner, enjoying a elegant yet welcoming atmosphere with a large terrace overlooking the sea, serving Mediterranean and Sicilian cuisine, and "Il Cappero", the ideal choice for those who prefer a more casual atmosphere. The lounge bar "Il Faraglione" enjoys a panoramic terrace overlooking the Faraglioni of Lipari and serves cocktail and drinks, with live music in the evening. The bar "Gazebo" by the pool serves refreshing beverages, cocktails and light snacks. Two outdoors pool, one with hydromassage and waterfall, garden and large terraces ideal for relaxing and taking in the surrounding breathtaking views and sunset over the islands of Alicudi and Filicudi. Guests can enjoy a private equipped rocky bathing area with direct descent from the hotel. The SPA recently opened, offers a large range of face and body treatments, aimed to re-stabilize health and balance the mind, body and spirit. The SPA also includes an indoor pool, sauna and Turkish bath. Congress facilities are composed of room equipped with modern audio-visual equipment, hosting a maximum of 160 people. The resort also offers a shuttle service to/from the hotel/port/centre plus a helicopter landing pad.